New York, Nov 30, 2011 (Global Fashion Wire) - Stylesight.com, the industry-leading global content and technology provider for professionals in the style, fashion and design sectors, announces an exclusive day of trend at The Blackman Hotel in Melbourne, Australia on December 9th. Stylesight's Associate Trend Director, Janelle Mannes, will offer guests a private look at Stylesight's unrivaled Trend Forecasting & Analysis. Held at The Blackman Hotel in Melbourne, Gallery III and IV, Stylesight will present its acclaimed S/S 13 Megatrends, which highlight the overarching themes for S/S 13 and the influencers that will inspire the complete design journey, touching on colors, materials, shapes and design details. 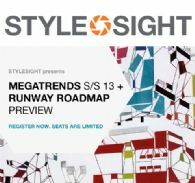 The presentation will be followed by a preview of Stylesight's Runway Roadmap, providing in-depth edits of the S/S 12 collections into four trends for S/S 13. Registration begins at 2pm with refreshments, and trend discussions begin at 3pm followed by a cocktail reception. Learn more about the day's agenda, and register to attend.